In the midst of 50th wedding anniversary party planning? 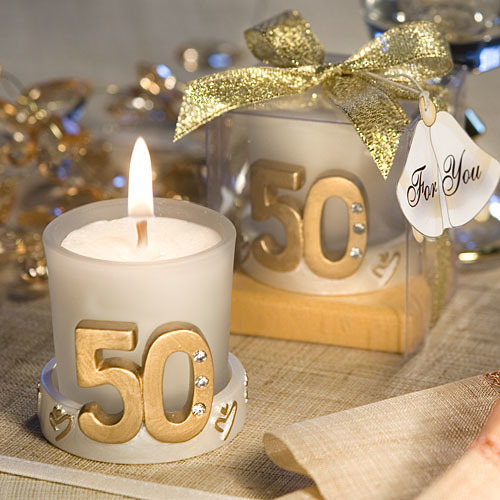 Our golden anniversary candles favors are sure to be well-received by your guests. Also wonderful for 50th birthday favors! Each favor has a frosted white glass holder with a poured white candle center, resting in a round gold resin base. The base's rim is cheerfully decorated with free-form heart designs. A bold gold, rhinestone enhanced "50" extends upward from the base, hugging the glass candle holder. Each candle favor is 2" x 2" x 2" and comes packaged in a deluxe clear topped box with a gold base, tied with a metallic gold ribbon and attached wedding bells thank you tag. Please allow up to 5 business days to fulfill your order; then add shipping time from NY.